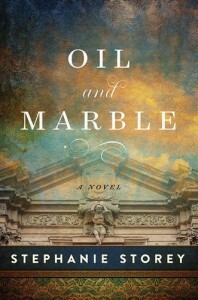 The novel is the author's take on two very important characters in history, Leonardo da Vinci and Michelangelo Buonarroti. Both men traveled in the same time/area: Florence, Italy in 1500. Both men were in competition with each other for commissions for artistic projects. Storey masterfully creates a very interesting (and plausible) story of the interactions. Specifically (without spoiling the book for you), how the competition/ego/pride drove each man to create the Mona Lisa and the sculpture of David. She manages to do this so well that you actually feel like you are there in a room with the characters. You sense their pain as they strive to be their best. Along the way she introduces other characters who were in the same orbit of time/place (such as Niccolò Machiavelli). It all weaves together wonderfully, resulting in an excellent read!